The feed horn holds the instrument placed in front of the dish to capture the reflected and concentrated signals. In theory, due to the parabolic shape of the reflective dish, the signals will converge into a focal point, intensifying it. Past this point however, the signal will diverge and start diminishing. 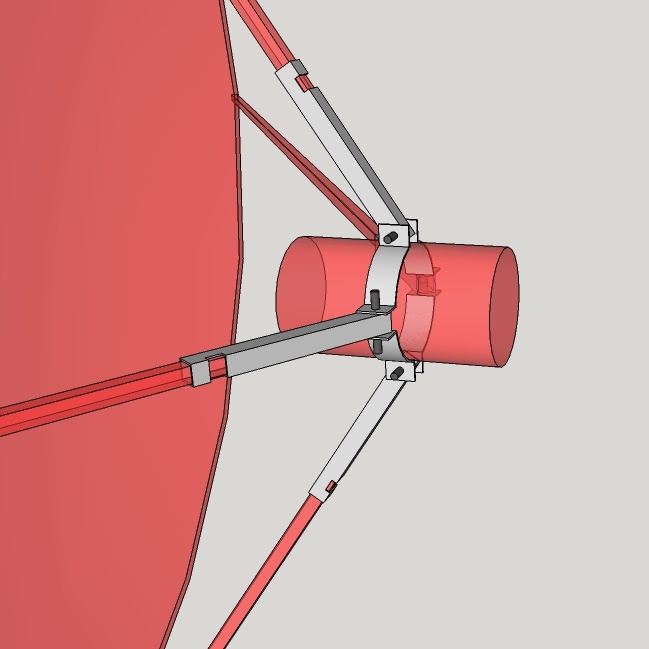 Optimally, we want the position of the feed horn to be the same distance from dish as the focal point. Furthermore, no matter the amount of precision, there will always be flexing in any structure. 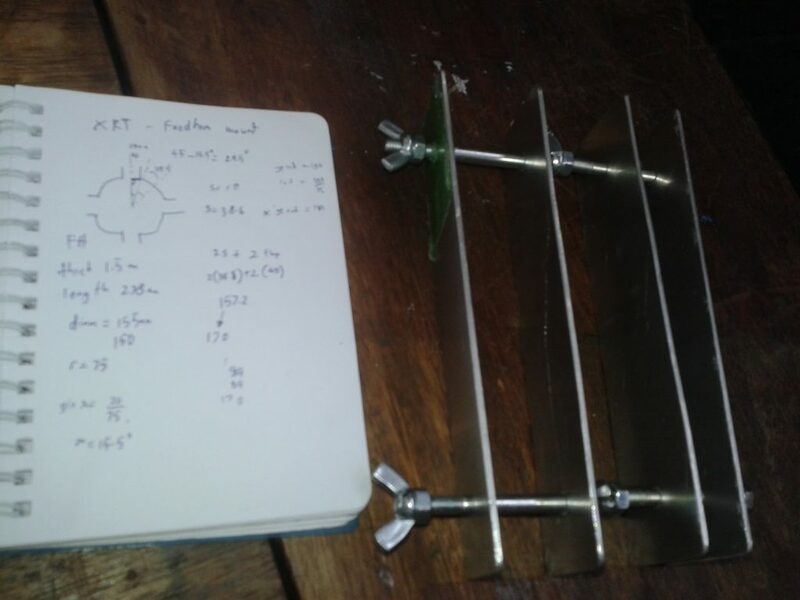 This deflection may be calculated and used to compensate for the shifting but we planned to solve this with a simpler method. 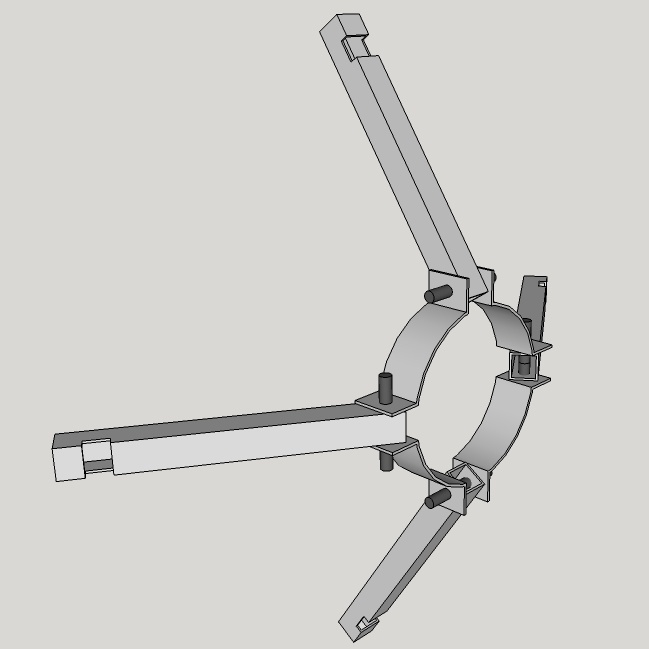 For the design specification, our plan was to make the mount adjustable. This also gives us some margin for inaccuracies in the construction. The construction must also allow repair and replacements so welding is generally undesirable. The material of choice is aluminium regardless of strength to weight ratio of the geometry. This is because of availability, machinability, and corrosion resistance. The mount will be exposed to water and direct sunlight (continuous UV exposure). Aluminium is one metal amongst a few that will form a thin oxide coating (rust) protecting the metal under it from further rusting. It is also UV stable unlike most natural or even synthetic polymers. The feed horn is cylindrical in shape. We do not want to make cuts or drill holes into it. The mounts will consist of a ring clamping around the feed horn and holding it with friction. 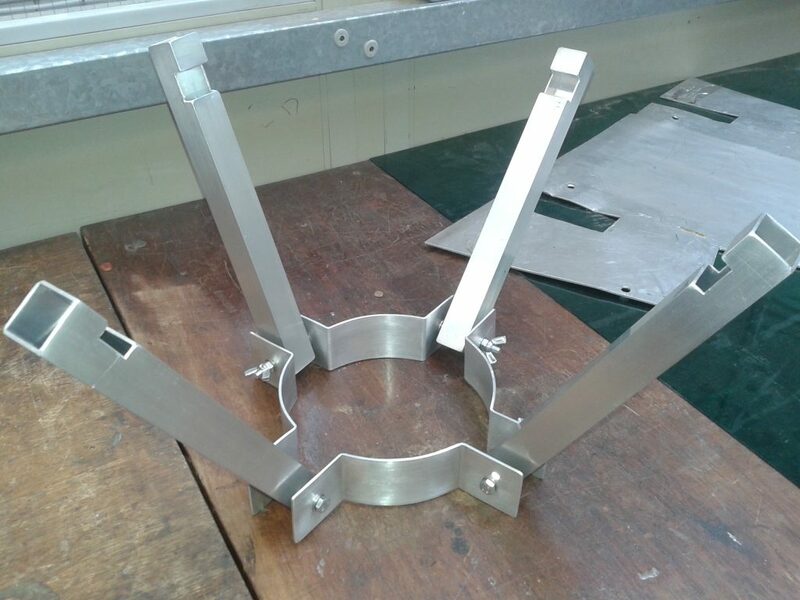 This ring connects to the dish with four struts and pin joints. From the specification booklet of the dish, it mentions the focal length being 2025mm. 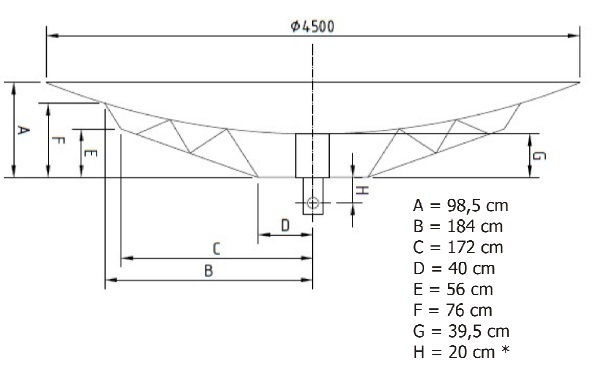 Refer image below for diagram given by the supplier. The struts are meant to be attached at the rim of the dish, hence the actual distance in direction of the axis of symmetry being shorter. The distance along axis from dish to rim is A(985mm) minus G(395mm) resulting in a distance of 590mm. Taking this off the focal length, a distance of 1435mm will need to be provided by the struts. 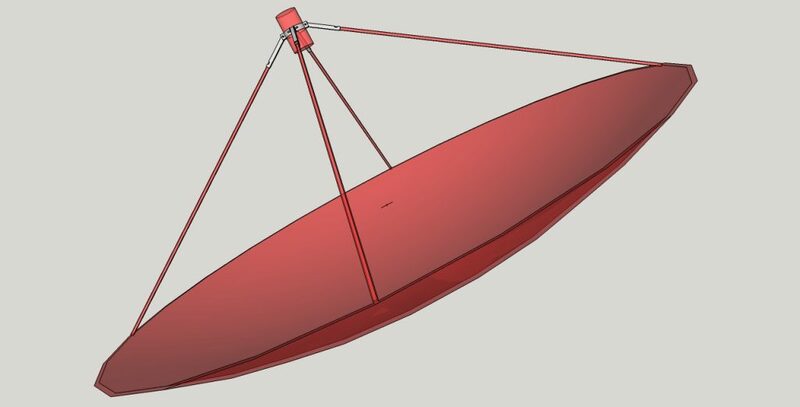 Theoretically, for a 4.5m dish, this corresponds to a length of 2670mm (pythagoras) at angle of ~57.5° (trigonometry) from the axis of symmetry. The ring is held by a tube that goes over the struts. At the ends of these tubes will be clamps to hold things together, also with friction. This gives the ability for the position of the feedhorn to be adjusted slightly along the axis. The concept of “tolerances” is taken into account. In the real world, it takes more resources to make things more accurate. Hence, when machining, the dimensions are given a certain range. For example, when a rod is to go into a hole, it can be made to allow sliding by making the smallest range of hole size to be larger than the largest range of rod thickness. In any case there will be a microscopic gap between the two parts, allowing movement like in a computer hard disk drive. This also allows lubricant to fill the gap. To make a tight fit, the smallest range of hole width is made to be smaller than the smallest rod thickness. As the rod is squeezed into the hole, it deforms elastically but just enough to still spring back to its original shape if separated. This creates some stress between the two parts, and creates friction to hold the two parts together. Machinists / technicians have charts for different kinds of fit at different size of holes and rods. In most real life applications, the precision required is in the range of hundredths or thousandths of a millimetre. Vernier callipers and micrometers are able to provide this. The feedhorn was measured to be 155mm in diameter. We chose the ring to have a tolerance of between 150mm to 154mm in diameter. Below is shown the 3D drawing for planning of the mounts and confirm that the parts do not interfere with each other. The software used was SketchUp, which is a free and simple CAD software provided by Google. The mount in relation to the dish, struts, and feedhorn. Full view of the assembly. 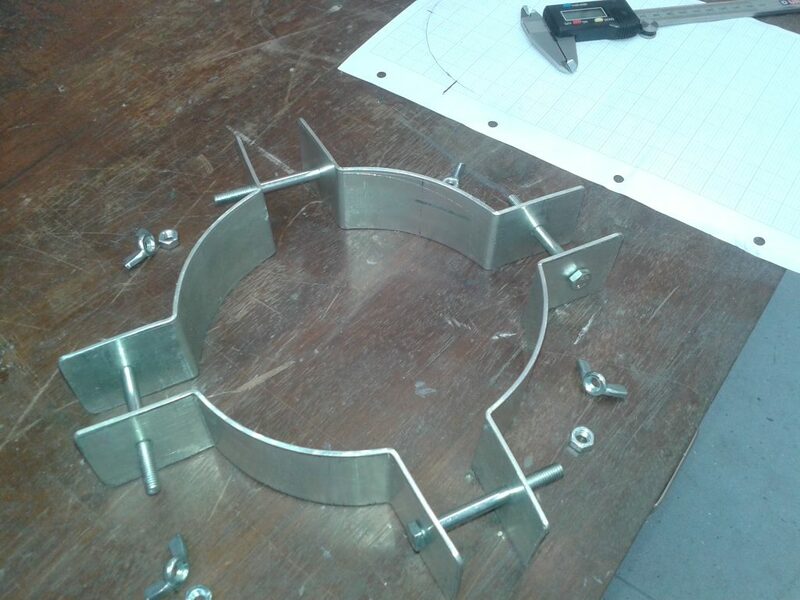 When building the ring for the mount, it is started off from 2mm sheet aluminium. Four strips were measured, marked, and then cut. Next, two 6mm holes are drilled near the two ends at a predetermined location. 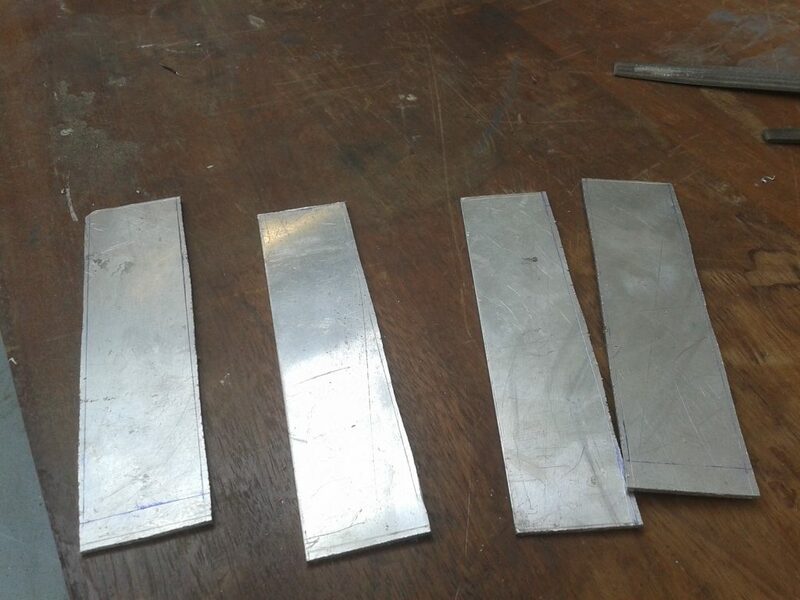 The strips are then rolled into the correct arc diameter with a sheet metal roller. In this step, the strips are progressively rolled from a flat shape into smaller diameters within several runs until it reaches a 150mm to 154 mm diameter curve. The ends are then pressed to flatten. Finally, the flattened part is then bent outwards. The square tube that goes over the struts were also measured, marked, and cut to length. Next, the holes are drilled and a slot is cut to fit in tighteners to grip onto the struts. The assembly uses M6 bolts and nuts. Wing nuts are used to allow easier assembly, requiring fewer tools. Washers are placed beside the metal to protect from abrasion during assembly, disassembly, or servicing. Spring washers are added to allow a finer tuning of the torque applied at the fixture. There are equal numbers of spring washers on each side of the square tubing to keep the tubes centered between the two plates it is connected to. These are the plates after cutting. Cuts were made slightly larger than the required, and trimmed / flattened out with finer tools. However, the finishing is not crucial. Holes drilled into predetermined positions. The ring after being shaped into a curve, with the ends flattened, and then bent. Final assembly after deburring, chamfering and polishing.